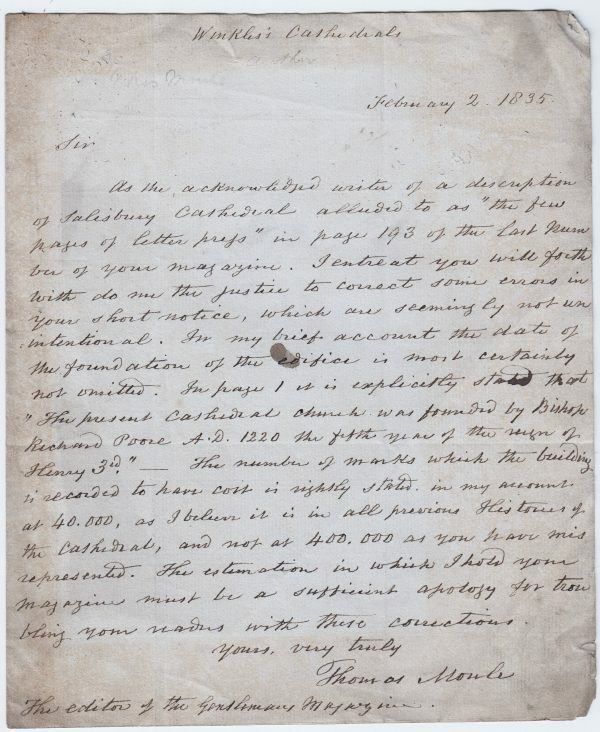 Autograph Letter Signed, to the Editor of the Gentleman’s Magazine, correcting errors in the the magazine’s notice about Moule’s printed description of Salisbury Cathedral. 1 page 9 x 7½ inches, toned and rather dusty, but sound and complete. 2 February 1835. Uncommon. Thomas Moule (1784 –1851), antiquarian, writer on heraldry, and map-maker. He is best known for his popular and highly decorated county maps of England, steel-engraved and first published separately between 1830 and 1832. He sold books in Duke Street, Grosvenor Square, from 1816 to 1822. Later, he became an inspector of ‘blind’ (illegibly addressed) letters at the General Post Office.